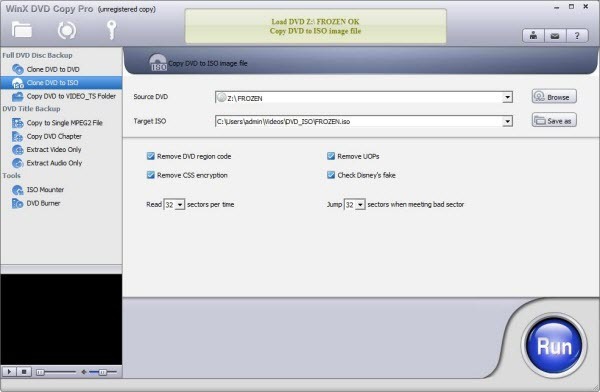 Get to know how to copy DVD movie into ISO on Windows PC. The content of a CD or DVD can be 1:1 duplicated in an ISO (International Organization for Standardization) image file entirely and completely. After copying DVD to ISO file, it is very convenient to burn ISO to DVD, or play ISO file with 5KPlayer, VLC, MPlayer, KMPlayer, SMplayer, Splayer and so on. WinX DVD Copy Pro is a professional DVD copy software program for Windows 10, 8.1, 8, 7 and lower, coming with 9 DVD copy modes. It is available to copy DVD to ISO image for convenient burning and playing. Supported DVDs including home-made DVDs, commercially encrypted DVDs, and even old damaged DVDs. DVD to ISO file copy is a kind of 1:1 full DVD disc copy. The output UDF ISO image file is identical to original DVD disc, in terms of movie content and structure. With intact DVD content and data, the ISO file can be mounted to a virtualized drive and burned to another DVD disc finally. In addition to DVD to ISO image copy, this DVD copy software for Windows (10) is also able to 1:1 clone DVD to a blank DVD, DVD to VIDEO_TS folder, copy main title as a single MPEG2 file, copy desired chapter, extract audio or video only, etc. To begin with, you should download WinX DVD Copy Pro setup file on your PC and install it following onscreen instructions. Then, follow the steps below to clone DVD to ISO file. Step 1: Insert source DVD. Insert the DVD you want to copy to ISO image into the DVD drive of your computer. Step 2: Select "Clone DVD to ISO". Open WinX DVD Copy Pro, choose Clone DVD to ISO under Full DVD Disc Backup. Then, your source DVD and Target ISO should be already detected and shown in the screen. You can also click "Save as" to choose another folder to store your ISO file. Step 3: Start Copying DVD to ISO Image. Click Run button to start copying DVD to ISO image. The whole copying will finish within very few minutes, and then you can find the ISO image in the destination folder. WinX DVD Copy Pro can well support copying DVD to ISO file, DVD disc, etc, and it is also a windows ISO burner. However, if you also require the function of DVD ripping (DVD to iPhone, iPad, iPod, Android, mobile phone, or DVD to AVI, MPEG4, etc.) from time to time, WinX DVD Ripper Platinum - the combination of DVD ripping and DVD copy - is your ideal choice. WinX DVD Copy Pro is able to mount DVD ISO image file by creating a virtual drive on the computer. Then the cloned ISO image can be applied to further ripping, direct playback and burning. For PC only. Mobile user Click here. WinX DVD Copy Pro can copy DVD to ISO image file on computer easily. It supports copy-protected DVDs, old scratched DVDs, and home-made DVDs certainly.